Is he a genius or a madman? A dreamer or a schemer? 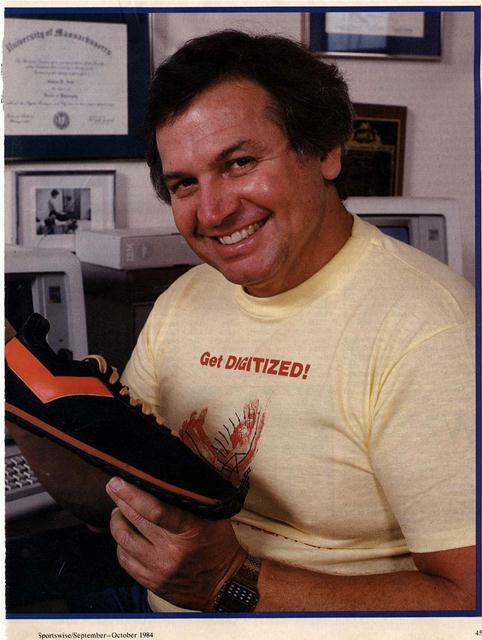 An apostle of high-tech athletics? Okay, so you know he's one of America's finest actors. 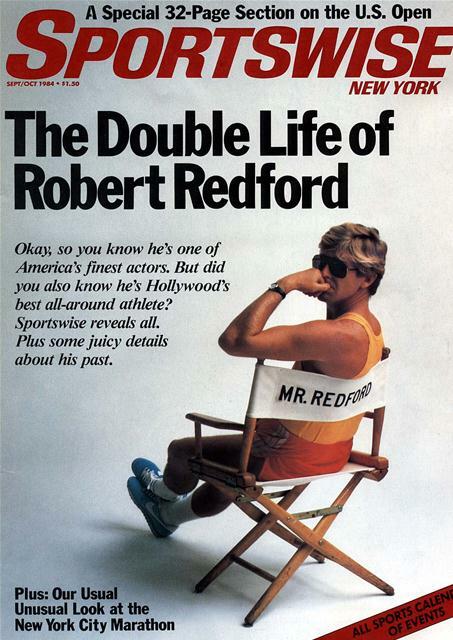 But did you also know he's Hollywood's best all-around athlete? Sportswise reveals all. Plus some juicy details about his past. Is he a genius or a madman? A dreamer or a schemer? An apostle of high-tech athletics? 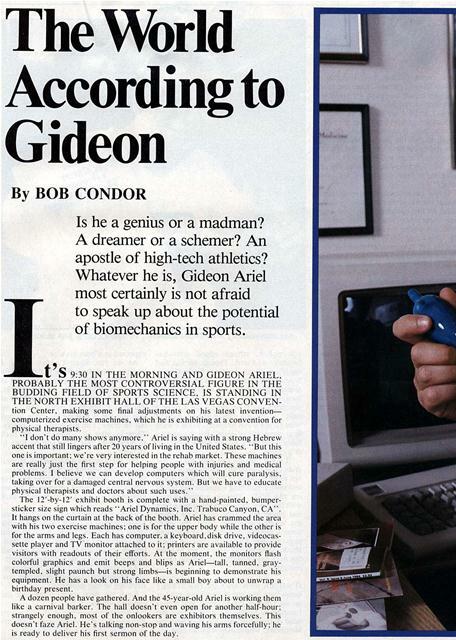 Whatever he is, Gideon Ariel most certainly is not afraid to speak up about the potential of biomechanics in sports. tion Center, making some final adjustments on his latest inventioncomputerized exercise machines, which he is exhibiting at a convention for physical therapists. "I don't do many shows anymore." Ariel is saying with a strong Hebrew accent that still lingers after 20 years of living in the United States. ''But this one is important: we're very interested in the rehab market. These machines are really just the first step for helping people with injuries and medical problems. I believe we can develop computers which will cure paralysis. taking over for a damaged central nervous system. But we have to educate physical therapists and doctors about such uses." The 12'-by-I2' exhibit booth is complete with a hand-painted, bumpersticker size sign which reads ''Ariel Dynamics. Inc. Trabuco Canyon. CA''. It hangs on the curtain at the hack of the booth. Ariel has crammed the area with his two exercise machines: one is for the upper body while the other is for the arms and legs. Each has computer. a keyboard, disk drive, videocassette player and TV monitor attached to it: printers are available to provide visitors with readouts of their efforts. At the moment, the monitors flash colorful graphics and emit beeps and blips as Ariel-tall, tanned, graytempled. slight paunch but strong limbs-is beginning to demonstrate his equipment. He has a look on his face like a small boy about to unwrap a birthday present. A dozen people have gathered. And the 45-year-old Ariel is working them like a carnival barker. The hall doesn't even open for another half-hour: strangely enough, most of the onlookers are exhibitors themselves. This doesn't faze Ariel. He's talking non-stop and waving his arms forcefully: he is ready to deliver his first sermon of the day. "You see here the future of exercise equipment!" he nearly shouts. "This machine accommodates you rather than you accommodating it. It reacts to your exercise efforts 16,000 times per second, always adjusting the resistance you are lifting against, according to changes in angle, timing and muscle fatigue. There are no weights involved. It won't make you lift any more or any less than you should throughout the entire range of' motion. It will maximize your exercise automatically. "How does it compare to others'? It is better than Nautilus. better than Cybex, better than Universal. It is better than anything on the market today. And it is not expensive. Let me show you how it works ... "
Ariel inserts a floppy disk, punches up a command and says, "Every person who uses the machine will have a personalized disk, one which considers your recent exercise performance and how you feel that day. It can also simulate the elements of any sport to better train your muscles. A shot putter will have a different program than a runner." Ariel moves under the machine's lifting apparatus and begins a set of bench presses. He does eight reps and leaps off the bench to carefully point out some special graphics on the screen. Then, with a quick and full grin, he adds, "you can even watch a movie on the video screen if you prefer, obtaining a printout of your workout performance when you're done." The crowd is reacting in ways which will be duplicated by visitors of the Ariel booth during the day: People glance at each other with "do you see what I see" expressions. Some whisper and nod and move toward the pile of product literature. Many more just simply smile and roll their eyes ceilingward. What, indeed, are we to make of this man? Is he a sports scientist? A dreamer-inventor? An apostle of high-tech athletics? "Well, all of those, really," Ariel says when asked. "I'm interested in human optimization. I believe everybody can be a gold medalist in his own body, with the help of computers." To put it in perspective, you could say Gideon Ariel is the Howard Cosell of the sports sciences. His work is attentiongrabbing; whether you agree or disagree with his ideas, it's difficult to ignore him. Ariel has taken the field of biomechanics, which is the science of applying the laws of physics to human movement, out of the laboratory and placed it into the cupped hands of both Olympians and recreational athletes. But what makes Ariel even more fascinating is his reputation as a publicity hound who is always willing to let the media associate his computerized analysis with world records and gold medals. And he doesn't stop at that; he regularly tells reporters that coaches have been practicing "witchcraft" and that it is time to take advantage of precise scientific analysis in sport. He says: "Compare coaches with bridge engineers. Suppose an engineer finishes a bridge and says, 'Wait, remove that beam.' You ask him why and he says, 'I took a survey of a hundred drivers and 75 of them said it looks better without the beam.' That is how coaches coach, by what looks best to them. But if the engineer did that there would be a lot of cars in the river. And he would find himself in the nuthouse." "The man is the Barnum and Bailey act of sports science," says one researcher at a midwestern university. "His kind of visibility the field of biomechanics doesn't need." "He's promising miracles," complains another sports biomechanist based at a university laboratory. "He makes all these great promises to athletes and coaches, which raises their expectations beyond reason. Then they're disenchanted when we can't deliver results in short periods of time. This science takes time." Perhaps the harshest Ariel critic is Arthur Jones, inventor of the Nautilus machine. The two men had a prolonged, bitter court battle over patent rights several years ago. "Oh, right, Gideon Ariel," Jones says when asked about Nautilus' plans to market computerized exercise machines, "he invented fire, he invented the wheel, now he's invented the best form of exercise on earth. It's un-American to write a story about that man. You're brainwashed if you believe his line of bull." "There's really no middle ground with Gideon." says Dr. Bob Arnot, a New York-based sports physician and scientist who's worked with Olympic athletes. "On one hand, he's a super-duper promoter of biomechanics and the science of sports in general. But, on the other hand, it's still questionable if there's scientific validity to everything he does. "Personally, I like the guy. And I kind of object to all the flak he gets. At least he's gone out and made a living from biomechanics. He's putting his ideas into action. All these so-called serious sports scientists are quick to criticize him. But what are they doing? Except for a select few, the rest of them stay within their cushy academic environment and write some incredibly incomprehensible research paper every other year. Even if Gideon were all show, at least everybody in the country is becoming aware of the potential of science in sports. Besides, it's not like he's distributing a bad drug or something. His work certainly isn't going to hurt athletes." Major companies are up in arms about Ariel's computerized advances for exercise. On the contrary. There is evidence that Ariel's research and development work has positively affected the performances of several world class athletes. For example, U.S. discus thrower Mac Wilkins, the 1976 gold medal winner at Montreal. says Ariel's computerized motion analysis showed him how to put more force in his throw rather than absorb it in his front leg. The result'? Wilkins, whose pre-Ariel best was 219'1". broke the world record of 226'8" in just his second competition after consulting the computer. The third time out, he broke the record again, eventually tossing the discus 232'6". More recently, Ariel assisted the U.S. Olympic women's volleyball team, which until this past year was not even ranked among the top 20 nations in the world. Ariel provided computerized feedback about the U.S. players' strengths and weaknesses, of the players' conditioning progress, and of the strategic formation patterns of international opponents. He also has contributed (in the high six figures) much of his own time and money to help the team become world class caliber. As it turned out. the U.S. women won the silver medal in Los Angeles last month, not losing a match they played until the final. hat's most exciting about Ariel's work is his determination to deliver technology to "the masses." His advances in developing computer software are making it possible. "We want our products and technology to be in the reach of every athlete at all levels," Ariel says. "Not bringing it to the everyday athlete is like having people wear raincoats in the desert. It makes no sense,"
Nowadays, his two Ariel 4000 exercise machines, which cost $16,5(x) apiece, are relatively inexpensive for health clubs, medical/rehabilitation clinics, schools and other such facilities. In comparison. a Nautilus system, which would require at least five to six times the space, runs between $60.000 to $75,000 for twelve machines. "Major companies try to buy us out every day," Ariel claims. "They all tell us the same thing: you could sell the machines for $40,0(x), $50,000 each and still get the same customers." IBM expect the personal system to be used more by schools, professional teams, private health clubs and other such institutions. Either way, the software, which Ariel says could he ready by year-end, is an astounding development in the personal computer market. Ariel has other projects in the works, most notably an inflatable running shoe, which he has developed and tested with his computers. "Running shoes put too much shock on the joints." he explains. "If we don't find alternatives to the conventional running shoe, we will be the healthiest cardiovascular society ever, but we will be living out our years in wheelchairs." Ariel's solution is the inflatable shoe, coming in four sizes (small, medium, large, extra-large). You fill the soles with enough air to fit the form of your foot. running on "tiny air mattresses." Why haven't we seen or heard of such models any sooner'? "Because that would mean re-tooling," Ariel says, "that's a dirty word to big companies." According to Ariel, he was receiving about $100.000 annually from a major shoe company not to produce an inflatable shoe, on which he holds the patent. Granted, it's safe to say part of Ariel's motivation of bringing technology to the athletic masses is business-related. But is that so bad'? Ariel says: "I'm working on new inventions and ideas every day. I love this. But in order to sustain this love-and hire good talent to help me carry the ideas through-we have to invest in our business and sell products. On the college campus. you have students who learn the field, then end up teaching it to the next wave of students. The pages in the textbook just get yellower and yellower. But in my business, we must put the ideas into action. We make one mistake and the companies won't come hack to us. They'll say. 'don't call us, we'll call you.' "
Curiously enough, at the root of Gideon Ariel's success is failure. As a 13-year-old growing up in Israel. he was a miserable athlete. A clumsy mess. The one always picked last when choosing sides for schoolyard games. And yet, he longed to excel at sports. In part, this was because he was a lonely, stubborn boy who was living at a boarding school/kibbutz for children from broken homes, about 20 miles outside of Tel Aviv. "It was a bad childhood," Ariel recalls. "I was a problematic child. My parents divorced when I was ten. They didn't want any part of me. I had no sense of family. I was a good student, but I wanted to be an athlete very bad. It was all 1 cared about." A million dollar research center. a state-ol the-art human performance laboratory i Coto de Caza, an exclusive, private re sort community about 60 miles south c downtown Los Angeles. On one wal hangs a blow-up poster of Albert Ein stein with the printed inscription: "Grea spirits have always encountered violen opposition from mediocre minds." riel is discussing his teenage day matter-of-factly, as if he is estab lishing postulates for a scientifi principle. "One year we got a ne% physical education teacher,' he continues "He told me I could be good at something Since I was a big boy, he said maybe should throw the discus. So I tried it. any I was not too bad. The teacher told me could be a champion, but I must work ver; hard. I promised I would. "So I became obsessed with the dis cus," Ariel continues. "I took it to class throwing to and from school, or durin, the day if I got a 15-minute break. I mad. barbells from broomsticks and coffe cans, which I filled with cement. 1 go American weight lifting books and trans lated them to Hebrew. By the time I wa 17, 1 was telling my friends I was going ti be a discus thrower in the Olympia Games. They all just laughed at me thinking I'm some crazy man." Crazy, maybe. But Ariel, as a 20-year old unknown, made the Israel Olympia team in 1960, breaking the national re cord at the trials. He fared poorly at th, Rome Games, but rebounded in 1964 breaking his own record at the trials setting a mark he still owns 20 year later. Again, at the '64 Games in Tokyo he didn't contend for a medal. No mat ter, he was proven to his toughest critic himself. "I am no different now," Ariel ex plains. "I still think if you put enougl into something, it will work. As long a the idea is not totally crazy, like trying ti high jump nine feet. But you have to liv with your dreams, work on them all th time. Working 8 to 5 will only make you boss rich, not you." After the 1960 Games and three year in the Israeli army. Ariel accepted track scholarship from the University c Wyoming, which was arranged by Dt LeRoy Walker. the former head coach c the 1976 U.S. Olympic track and fiel, team who coached Israel and Ariel in th late 1950s. During his college years he married hi girlfriend hack home, an Israeli dances The marriage didn't work, Ariel says because he had to make a choice be tween his computers and his Tamil) which by then included a baby daughter "I found I loved my computers more, he says evenly. Today. Ariel rare) makes the effort to see his 20-year-oI daughter, who lives with her mother i the Los Angeles area. Gideon Ariel's most significant scientific breakthrough-the one sure to make the textbooks-has come in the form of computer programming, which he has painstakingly applied to biomechanical (human motion) analysis. "What he and his staff can do with a computer is incredible," says Dr. Bob Arnot, a sports physician and scientist who has worked with Olympians. Ariel's innovative software allows for a betterdetailed analysis of filmed performances of athletes, a widely-accepted coaching tool. Ariel's analysis begins with filming the athlete from several camera angles, using high-speed film (up to 10.000 frames per second). Then the film is projected, frame by frame, onto a "digitizer" which is a two-foot square screen lined on two sides by 20,000 tiny directional microphones. As each frame appears on the screen, a sonic pen is used to dot and connect the athlete's joints. this information is fed into the computer. The computer then returns a series of three-dimensional stick figures (the athlete in motion) on a graphics display terminal. The stick figures representing the athletes can be viewed from front, side and top angles; they can be frozen in a single frame, watched as a single figure over continuous motion, or each frame can be blended together to chart a "swirling" movement pattern. The speed and acceleration for the athletes can be checked: graphs can be produced to show changes in the center of gravity throughout a movement; or stored data can be called up to the screen to compare an athlete's performance to past achievements or even another athlete. 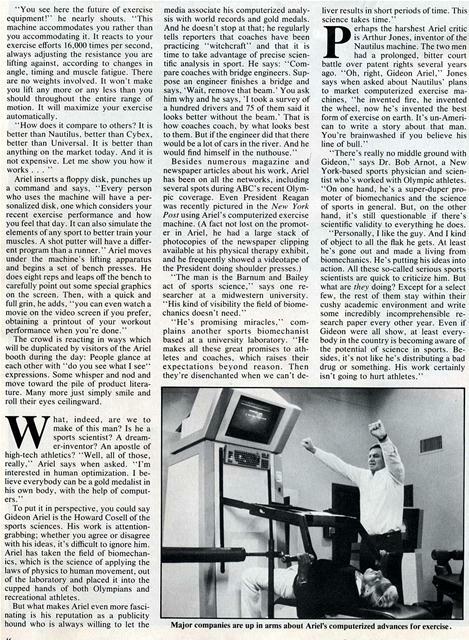 Also, Ariel has programmed the computer to allow for play with an electronic copy of the athlete, changing angles. timing, even the person's weight, and calculating how each manipulation affects performance. What do these stick-figure graphics show that can't be discerned from slowmotion film, the old standby of the coaching profession? "Your eyes can't 'see' forces and velocities," says Ariel. "You have to calculate the results of numerous equations (the computer does this) and present them graphically on the computer display to see these movements, and to see what the athlete must change to optimize his action and get the most from his force." Moreover, sometimes an action happens so rapidly that the human eye simply cannot follow the line or range of motion, even if it is slowed down on film. Yes, your hands (and arms, legs and everything else) are quicker than the eye. -B.C. WUpon graduation from Wyoming, Ariel tried a semester of medical school but found he'd rather "deal with health than disease." So he enrolled at the newly created School of Exercise Science at the University of Massachusetts, where he got his masters and Ph.D. hile he was still a graduate student there, Ariel formed his own company. Computerized Biomechanical Analysis (CBA). This business, which still has a lab in Amherst, stemmed from a life-turning discovery Ariel made in an elective computer science course. It was there that he first made the connection of applying computer programming to human motion analysis. His computer science professor, Dr. Conrad Wogrin, still at UMass, recalls the semester: "Gideon came to me one day and asked me if it was possible to write software to do away with the enormous paperwork involved with exercise science (mostly physics). I told him anything's possible; it's just the sort of thing you just have to go out and do. I'll be darned if he didn't come back a few months later with a program worked out." Wogrin pauses, then adds, "You know, Gideon credits me with getting him started in computer science. I'm flattered, but motivating him is about as hard as coaxing water to go downhill. The man's a dynamo." It is a bright, sunny California morning. Gideon Ariel, wearing a powder blue tennis shirt, new jeans and old running shoes, is leaving his cozy but expensive condominium. Its furnishings are modern, lots of earth tone fabrics and teakwood, a flurry of hanging plants and all the latest in electronics. Its setting in Coto de Caza. nestled in the foothills of the Santa Ana mountains, puts a price tag of close to $400,000 on the onebedroom home which he shares with business partner and mate, Ann Penny, who he's known since grad school days. He's now pulling out of the carport in his metallic blue Chevy Caprice, a fourdoor job with 120,000-plus miles on the odometer. Normally. Ariel walks to work (about a quarter-mile away) or hops on his small Honda motor scooter. But today he has a visitor and is "showing him around the place." Besides the research center, the place at hand includes Vic Braden's world-renowned tennis college, a recreation clubhouse and pool and carefully-placed six-figure homes to complement a small condo complex. Ariel is driving and pointing, looking at everything as if it were his first time. He then pulls the car up a hill, parks it on the shoulder of the road and moves farther up the hill on foot, waving his companion to follow. "This is where our new research center will be someday, overlooking these mountains and this lake. It will be fantastic. We'll build a home here, too, as part of the center. It will be beautiful." 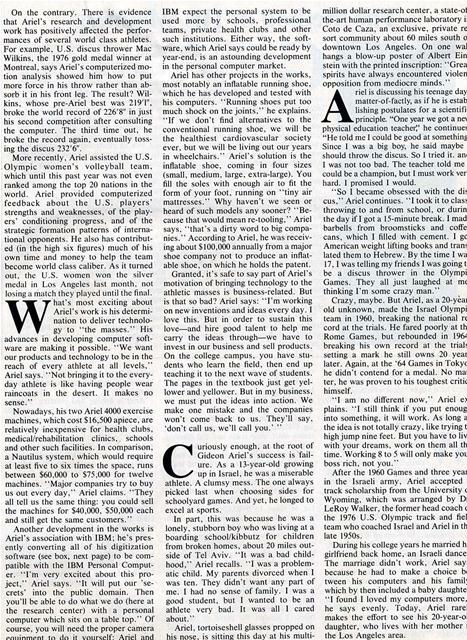 He pauses for a long moment, then at a measured pace, he says, "Sometimes I kid Ann about how a poor child from a kibbutz can come so far. It seems unbelievable at times." He ponders what he has just said. He purses his lips and pushes his glasses back toward his eyes. He scans the site and looks back to the research center. "Well," he says, his voice quickening, "maybe it is not so unbelievable after all." He hustles back to the car. There's work to do. 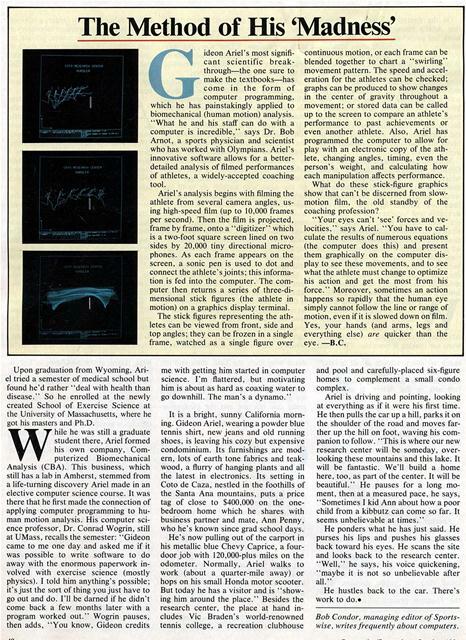 Bob Condor, managing editor of Sportswise, writes frequently about computers. Generated on 4/24/2019 8:49:32 AM (PST) ADI/HQ/GBA/2019/ARIELCLOUD/v3.0.2018.0126.